This photo is courtesy of The Macomb Daily. Unfortunately, I don’t remember who took it, possibly David Dalton. 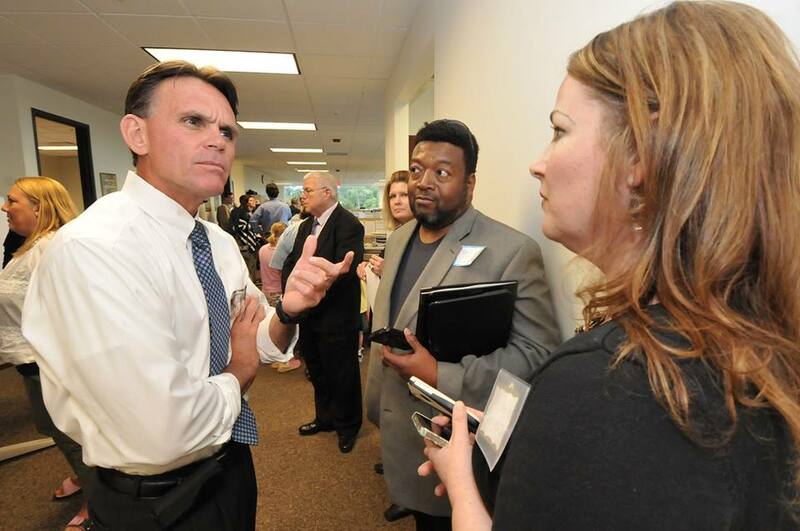 But that’s me talking with Macomb County Executive Mark Hackel at the Macomb Regional Community Media Lab launch party Tuesday. 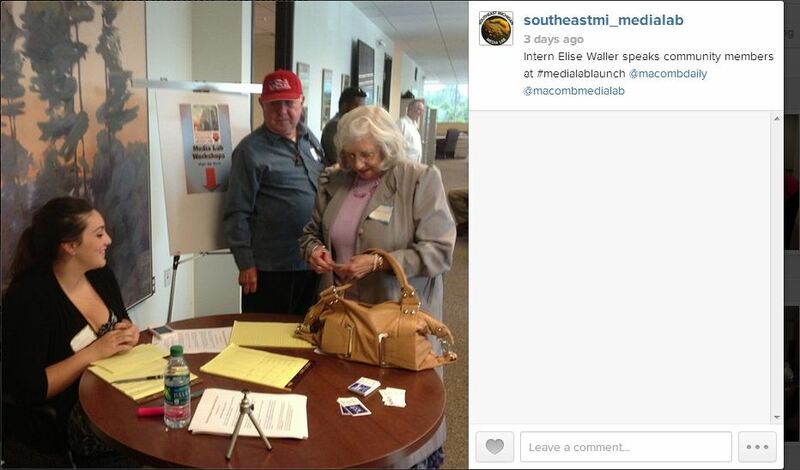 I had the honor Tuesday of helping Maryanne MacLeod, community engagement editor at The Macomb Daily; Jeff Payne, editor of The Voice Newspapers; and Jody McVeigh, editor of Advisor & Source, launch Macomb County’s first community media lab with an open house at The Macomb Daily, 19176 Hall Road, in Clinton Township. The event attracted more than 135 people, including Macomb County Executive Mark Hackel and Clinton Township Supervisor Bob Cannon. Both joined 21st Century Media Michigan Group Publisher Jim O’Rourke and Group Editor Glenn Gilbert at the ribbon cutting. I put together a video for the media lab’s YouTube channel featuring all four speaking about the media lab and its aim to bring the audience inside the newsroom as news-sharing partners. Maryanne had more than 61 people sign up for workshops at the media lab. My intern, Adrian College student Elise Waller, manned a table promoting the workshops and took names of people interested in attending. Time slots for one-on-one instruction with Maryanne were also booked. What’s great is Maryanne’s help and the workshops are free to the public. I thought Maryanne and her team did an excellent job of putting together the community event. It was much better than when I launched our first media lab in Ypsilanti April of 2012. Maryanne, Jeff, Jody, Elise and I all brainstormed ideas for the launch party, as well as the lab, earlier this summer and it was great to see it all come together. I really loved a video they created that played on a loop during the party. This is something I did with the launch of the Southeast Michigan Media Lab, and I suggested Maryanne consider doing the same. On it, staff members talk about the expertise they can share with people who come to the media lab for instruction. One of the more interesting draws to the party — and which will continue to attract people to the media lab — was a rotating art exhibit. For the launch party, the Black and White show, a collection of artwork donated by three Macomb County-based art organizations affiliated with the Anton Art Center, was on display. Another big draw was a workshop, held during the party, for anyone interested in contributing community sports coverage to 21st Century Media publications in Michigan. 21st Century Media is managed by Digital First Media. George Pohly, Macomb Daily sports editor, led the workshop, which attracted about a dozen people. Maryanne also created a hashtag (#MediaLabLaunch) for staff and the public to use during the event to share Tweets, Instagram photos and Touts, which is short-form video DFM reporters are using and encouraging the public to use. The party also featured community partners and bloggers, who were sharing information and hawking their wares. At the end of the evening, guests were given a chocolate bar with a wrapper noting the occasion, another great idea by Maryanne and her team. It was a nice memento and, as my intern noted in her Instagram photo, you can’t go wrong with chocolate. While the party marked the official opening of the media lab, Maryanne has been helping bloggers for quite a while as part of her role with the company, but now she has a dedicated space to do it. The new space, which is set up like a classroom, will allow her and the three publications to expand their community outreach and build partnerships. A regular schedule of workshops will be offered on social media and digital media, as well as community-driven workshops. The next workshop is 1 to 3 p.m. Sept. 12 on news writing and alternative ways of sharing news, such as video, photo slideshows and audiocasts. Elise and I set up the media lab’s Facebook page and Meetup.com profile, where workshops are listed, as well as its YouTube channel, blog, Twitter and Instagram accounts, RebelMouse page and uStream channel. These are all basic digital tools, in my opinion, needed for a media lab, as well as any new venture. During the ribbon-cutting ceremony, Maryanne noted my help and referred to me as her mentor. Her words touched my heart. I had just viewed my role as helper and I was honored when she called me a mentor. I also got a kick out of reporter Jameson Cook noting my presence at the party in his news story. It’s not often that a former editor and reporter becomes part of the story, but I did, and it was fun to see my name in print, outside of a byline. 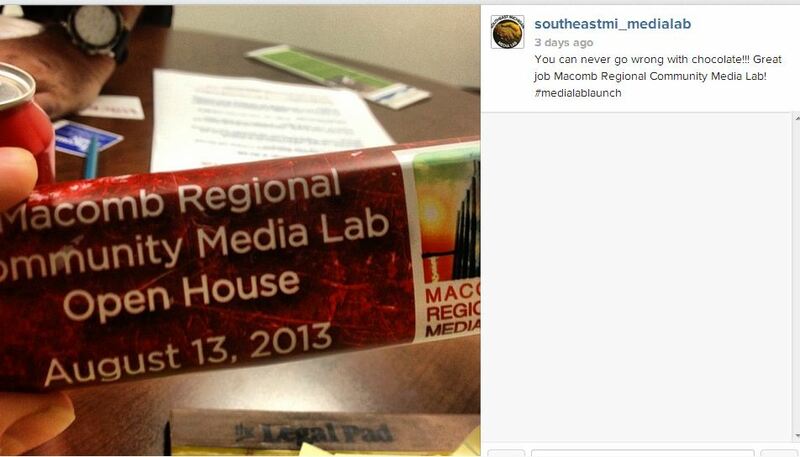 I know the Macomb Regional Community Media Lab will be a success, and it was badly needed. I had a few people drive the 126-mile round-trip from Macomb County to the Southeast Michigan Media Lab in Ypsilanti, which I operate, for workshops and instruction. It’s nice that they now have support in their own community, and I am glad that I played a small role in that. Next up, hopefully, is Mount Pleasant. I would love to work with the team there to launch a media lab affiliated with The Morning Sun. Let’s see what the next year — or several months — brings. 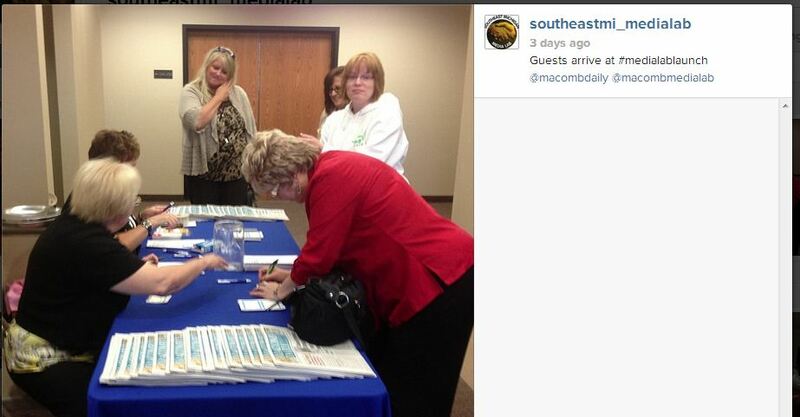 Guests check in and enter a raffle at The Macomb Daily office Tuesday for the launch of the Macomb Regional Community Media Lab.